Today is the pilot testing of the EDSA "Express Connect" Bus system that will last for 2-months. MMDA and LTFRB are tandem to this new "express bus" project with three routes around Metro Manila. There will be 50 passenger buses to deploy on 3-routes. Express bus will be equally divided to each routes. Route E1 (Fairview-Ortigas Avenue/Gil Puyat Avenue LRT station), Route E2 (Fairview-Ayala Avenue/Gil Puyat Avenue LRT station), and Route E3 (Fairview-Ayala Avenue MRT station-SM Mall of Asia rotunda). MMDA Chairman Francis Tolentino said, "The pilot run of the express bus service will last for two months." 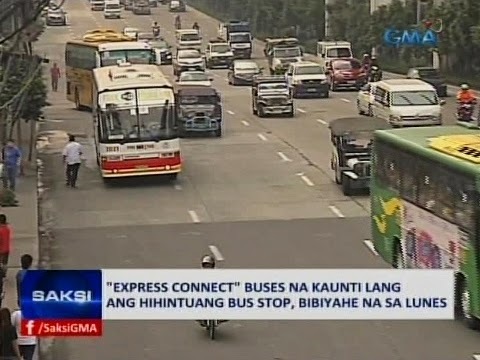 Then LTFRB Chairman Winston Ginez said, the "Express Connect buses would operate daily from 4 a.m. to 10 p.m."
The same to the ordinary buses, you have to buy tickets to conductors inside the bus. And the amount of fares are the same with the air-conditioned bus current charges. E1 Route: Fairview, Litex/COA, Batasan, Ortigas, Megamall, Ayala Avenue. Gil Puyat LRT station and the Cultural Center of the Philippines parking area (Roxas Boulevard). E2 Route: Fairview, Litex/COA, Batasan, Ayala Avenue, Gil Puyat LRT station and the Cultural Center of the Philippines parking area. E3 Route: Fairview, Litex/COA, Batasan, Ayala MRT station and SM Mall of Asia rotunda. With these express bus system, it will surely help decongest traffic along EDSA as motorists can now take the express bus system instead of driving their cars, according to MMDA Assistant General Manager for Operations Emerson Carlos. Comments or suggestions about "Pilot run of the EDSA 'Express Connect' Bus System" is important to us, you may share it by using the comment box below.